Kuala Lumpur, April 10: Former Malaysian Prime Minister Najib Razak's wife on Wednesday pleaded not guilty in a new corruption case where she was charged with accepting a bribe of 5 million ringgit ($1.22 million) related to a school solar project. 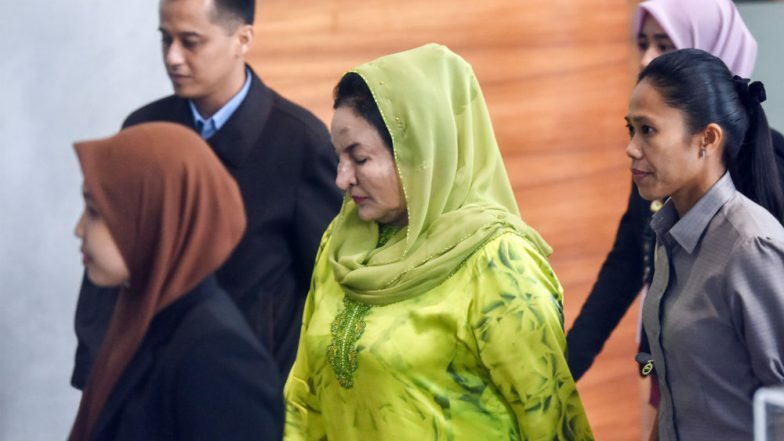 Rosmah Mansor, who has been on trial over the embezzlement of state funds, allegedly received the money on December 20, 2016, from a private company, Jepak Holdings, in exchange for helping them to secure a contract to supply and install solar energy panels in 369 schools in the state of Sarawak on the island of Borneo. Former Malaysia PM Najib Razak's Wife Rosmah Mansor Arrested by Anti-graft Agency. Jepak had secured the contract, called "Project Bersepadu System Solar Photovoltaic (PV) Hybrid", valued at 1.25 billion ringgit ($350 million), without an open tender, according to the statement by a Kuala Lumpur court. Mansor, 68, who faces 19 other allegations of corruption, faces a maximum sentence of 20 years in prison if convicted in this case, which the High Court will hear on July 10. Najib, who has 42 charges of corruption against him, and his wife are accused of siphoning millions of dollars to their private accounts from the state fund 1Malaysia Development Berhad (1MDB). Najib, 65, who served as Prime Minister from 2009 to 2018, appropriated about 2.6 billion ringgit, a media investigation had revealed in 2015. The first of a series of trials against Najib on corruption charges began on April 3. He, however, denies all corruption charges. After winning the elections in May 2018, the new Prime Minister and Najib's former mentor, Mahathir Mohamad, reopened the investigation into the alleged corruption in the state fund. In addition to Malaysia, half a dozen countries, including the US, Switzerland and Singapore, continue to investigate the embezzlement of the Malaysian state fund. The US Justice Department estimated $4.5 billion had been diverted from 1MDB of which about $1 billion may have been laundered in the US through the purchase of real estate , yachts, jewellery and works of art, among other goods.